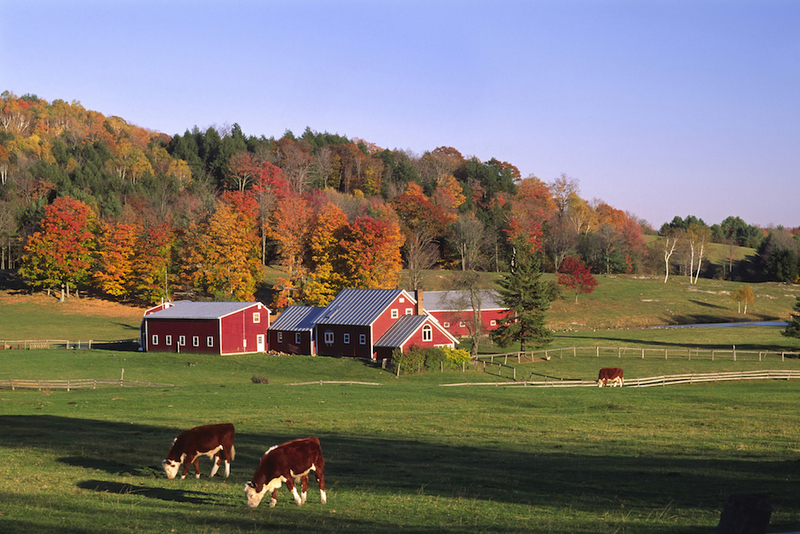 Cows grazing at a farm near Thetford, Vermont. The farm bill is America's largest funding source for private lands conservation; its programs can be better leveraged to attract billions of dollars in private investment, increasing the economic and environmental benefits of conservation on working lands. The Dust Bowl was a watershed moment in American history—one of the earliest warning signs that the risks of poor environmental management can have spillover effects across society. In the 1930s, millions of tons of valuable soil were blown off the Great Plains, stripping agricultural potential from the region. Thousands of families lost their farms and were left to start over or join mass migrations to more promising parts of the country. The drought and dust storms laid bare the inextricable link between healthy lands and the health of a nation. For many, they were a wake-up call as to how poor land management practices can lead to devastating and far-reaching consequences for the economy, people, land, water, and wildlife. This realization resulted in a shift in how governments and businesses viewed their collective responsibility to the environment. For example, the U.S. Department of Agriculture (USDA) implemented a soil conservation program in response to the Dust Bowl.1 Over the subsequent 80 years, the USDA also incorporated into its conservation efforts programs to conserve wildlife habitat, to use fertilizer more efficiently, and to protect wetlands and streams. These programs have helped prepare American agriculture for droughts and protect important ecosystems. Yet despite the widespread impacts of environmental issues on the nation’s health and economy, conservation efforts are chronically underfunded. Recent research suggests that, globally, about $300 billion in annual spending is necessary in order to maintain or restore the ecosystems and natural processes critical to human well-being.2 However, global philanthropic and government expenditures only amount to approximately $40 billion each year—well short of what is required.3 To avoid an experience akin to the post-Dust Bowl reckoning of the 1930s, policymakers need to expand how they think about conservation and conservation funding. One approach for growing the existing conservation funding pool is to engage businesses and attract private capital. Many private entities—from water utilities to Fortune 500 companies—directly benefit from clean water, clean air, and other environmental benefits that conservation can produce. Novel financial instruments, markets, and pay-for-success programs have the potential to engage these supportive groups—and attract billions of dollars in private investment to solve environmental problems—by providing incentives such as direct payments or cost savings to companies and landowners. The market potential exists; more than $1 billion in private capital has been invested in North American environmental markets since 2015.4 Still, an estimated $3 billion in additional capital is earmarked for conservation but on hold for projects that are ready for investment.5 Because these goods and services—clean air, clean water, and wildlife habitat—are often free and accessible to all, they are not something around which a market typically develops. As a result, government agencies have a particularly important role to play in developing innovative programs and policies to grow nascent markets and secure the services that landowners provide to consumers, companies, and the country by improving natural systems. This type of market has already emerged for certain types of environmental restoration, such as the wetland mitigation banking industry, and presents a way forward that will draw greater private investment into conservation on working lands. In the United States, the largest single source of public conservation funding comes from an unexpected piece of legislation: the farm bill. Although the bulk of the farm bill focuses on commodity subsidies and nutrition assistance, the most recent version allocated more than $5 billion in annual funding for various conservation programs.6 The farm bill is also a venue to set policy and pilot new programs that grow conservation on working lands in order to balance production of crops, timber, and livestock with environmental quality. For example, new efforts, such as the Regional Conservation Partnership Program, have used existing USDA conservation funds to leverage more than double their federal expenditures through collaborations with businesses and nongovernment organizations (NGOs).7 The next farm bill provides a unique opportunity to expand on this type of program and grow the pool of conservation funding. The Center for American Progress and the R Street Institute often approach policy challenges from different perspectives. However, we were inspired to work together on this report because we jointly recognize the scale of the conservation challenges that the nation faces—and the power of the farm bill to address them. The recommendations offered in this report provide a bipartisan approach that draws on measurable outcomes and market-based incentives to increase the social, economic, and environmental benefits of private lands conservation. Enable the USDA to support pay-for-success programs, environmental markets, and other conservation innovations. The bill should expand the USDA’s authorities to better attract private investment and support wider adoption of conservation practices, including allowing the use of pay-for-success contracting models to improve performance; streamlining enrollment processes to support conservation partnership programs; and creating a revolving loan fund or loan guarantee program to share financial risk with landowners and businesses as they invest in environmentally friendly pursuits. Support USDA investments in conservation innovation.The bill should double funding for Conservation Innovation Grants (CIG) and expand its focus to include grants, loans, and other startup support to help innovative, market-focused projects become established. Incorporate ecosystem services into USDA data collection. The bill should commit to timely research on the economic value of conservation activities. Quantifying the benefits of conservation will help draw investments that support existing programs. Focus research on program design and implementation. The bill should introduce new social and economic research efforts to understand how and why landowners participate in conservation programs—such as technical assistance, environmental markets, and partnerships with private investors—to help refine policies and programs so that they reap the greatest benefits for landowners and the public. These actions have the potential to benefit businesses, landowners, and communities that are tied to the condition of agricultural and forested lands. Together, these programs provide roughly $5 billion annually in federal financial and technical assistance to interested landowners and have leveraged significant funding from outside government to make other investments in conservation. However, there is also significant unmet demand due to limited budgets; it is estimated that EQIP support has been awarded to an average of 30 percent of proposals in recent years because of funding constraints.16 Increasing the public benefits of private lands conservation and taking advantage of landowners’ desire to manage land for wildlife and natural resources will require funding support beyond what is currently available. Environmental services: The range of benefits provided through the functions of ecosystems, including water storage and filtration, soil retention and enrichment, and carbon sequestration. Habitat restoration: Land management activities conducted with the goal of returning some ecological function to an area and making it more suitable for wildlife. Examples range from prescribed burning in forests and rebuilding wetlands to removing aging dams. Environmental market: A market created in order to increase the provision of environmental goods or services. These are often driven by regulation and used as an alternative to fines or citations to secure the provision of ecosystem services or pollution abatement. For example, instead of reducing certain types of water pollution from a wastewater treatment plant through mandatory on-site renovations, an equal or greater amount of water quality improvement can be achieved through abatement elsewhere, such as through improved agricultural practices. This arrangement is organized by regulation, where seller reductions are certified by a third party or government agency and then purchased by the water treatment plant owners. The goal is to create incentives for pollution reduction at lower costs. Addressing the scale of conservation problems means confronting significant challenges—namely, enticing additional investment and ensuring that existing funds provide the greatest conservation benefit. Private capital is one option for expanding the investment pool, but financial risk—the possibility that an investment will not generate a return—limits interest. Government agencies do not require a financial return on investment, but constituents and policymakers have an interest in maximizing the social and environmental return on conservation funding. If payments are made before a good or service is delivered, there is a risk that delivery will not occur. This creates a performance risk that affects funders’ willingness to support a project. A pay-for-success approach can help address both financial and performance risk. The model works by structuring the payment to occur after some desired outcome has been achieved rather than having the payment occur at the start of a project or for inputs. This structure is often simple—someone receives a payment based on improvements in one outcome—but complex structures have also been proposed, with graduated payments based on a range of outcomes or on incremental gains in one outcome. This creates the potential for financial returns that are attractive to private investors and guarantees a social or environmental return for the public. The theory is that basing rewards on outcomes will encourage program participants—either a target group of landowners or investors collaborating with those landowners—to find effective ways to meet goals that otherwise would not have been pursued. Linking incentives to performance has been tested in a variety of settings to find cost savings and spur innovation that can be more widely adopted. Cost savings: Because payments are tied to observed, measurable outcomes, the pay-for-success model has the potential to increase environmental return on investment for the public. Innovation: Properly structured incentives can encourage innovation as landowners and other private actors find more efficient ways to complete a task. This is useful in conservation, since environmental values and benefits vary greatly across properties, watersheds, and regions. Finding conservation strategies that work—and increasing their scale—requires testing different approaches. Private actors can play an important role in this. Increased private investment: USDA conservation programs have always targeted goods and services that markets tend not to engage, such as the value of soil conservation or downstream water quality. As scientific understanding of the connections between these goods and services and land stewardship improves, pay-for-success contract models can help guarantee benefits to private users, such as drinking water utilities, and build market demand for environmental improvements. Social policy programs have been a major focus of existing pay-for-success efforts. Pay for success has been piloted in several states to find new ways of providing better delivery of services, such as health care and education, or to reduce negative social outcomes, including recidivism. South Carolina, for example, uses a pay-for-success model to increase health care outcomes under the state’s policy objectives for mothers and children. The program rewards investments that make health care more accessible for low-income parents by tying payments to observed reductions in the rates of pre-term births and other health metrics.19 The state will monitor other long-term metrics such as school performance to determine the social value of the program. The pay-for-success model is intended to extend the reach of health services—which are critically important for young children—and to help participants overcome barriers to access. Drinking water utilities have developed agreements with landowners in their source watersheds—known as payments for watershed services contracts—which pay landowners for stewardship activities or land uses that improve water quality for utility customers.22 It’s a win-win situation: The utilities ultimately save money by reducing the need for treatment; landowners are compensated for actions that help the environment; and consumers have clean water. USDA conservation programs already have characteristics that align with pay-for-success initiatives, which creates an easier path to finding opportunities to utilize this approach. These shared traits include the use of positive incentives and voluntary participation, as well as a focus on measurable environmental metrics that can be used to set outcomes. Pay for success also complements ongoing research efforts by the USDA and its partners to understand the links between land management and environmental services. This research has helped shape metrics, such as acres of habitat or tons of avoided nutrient runoff from agricultural fields, that can be measured as outcomes. This helps utilities, businesses, and government agencies gain confidence in the value of investing in environmental services and drives demand for landowners to provide them. In June 2017, for example, a group of Arkansas rice farmers, with the support of the USDA and environmental NGOs, became the first rice producers to generate and sell carbon credits for measurable reductions in methane emissions through rice production.27 Methane is a powerful greenhouse gas that rice fields often emit when they are flooded. Models of greenhouse gas emissions from rice fields were used to identify by how much methane emissions would be reduced if fields were periodically dried. Farmers who adopted this practice received carbon credits for their efforts. Their improved land management practices became a marketable asset, and they sold the credits they generated to Microsoft Corp. as the company sought to compensate for its own emissions. Several factors affect the potential of pay for success to improve existing conservation programs. These factors include structuring incentives to appeal to landowners and targeting investments to ensure that benefits exceed costs. Such limitations will affect how and where the concept of pay for success could be a useful part of USDA conservation programs. Voluntary conservation programs—pay for success or otherwise—need to be attractive enough for desired participants to enroll. Barriers to enrollment can stem from a range of factors, including the design of incentive payments; uncertainty about the likelihood of a payout, or the odds that a landowner can meet the requirements for success; the transaction costs, including the time, energy, and investment necessary to participate; and access to the technical and financial resources that help with participation. Pay-for-success programs can be more complex than simple enrollment programs such as the Conservation Reserve Program or EQIP, so these factors need to be carefully considered and understood. Regulatory certainty can have a range of effects on both pay-for-success and environmental markets, as regulation affects investments. For example, it can affect how a business will reduce carbon emissions or whether restoring habitat will generate credits that can be sold as mitigation. Changing or even threatening to change the regulatory environment shifts the range of risks that landowners and investors have to consider. While some regulations have created stability, such as in the wetlands mitigation banking market, this is not always the case. Finally, the demand for the provision of ecosystem services will affect pay-for-success or performance-based conservation efforts. Over the past decade, a great deal of effort has been focused on attracting additional investment into conservation. Successes are evident in some contexts, including, for example, utilities’ investments in watershed management.32 However, demand for other environmental benefits, such as carbon storage and sequestration and habitat conservation for threatened species, remains limited. Regulatory changes or other economic triggers may change this trend, but until then, coordination problems may limit market development. Conservation outcomes—either actual changes to an ecosystem service such as water quality or proxy measurements, such as acres of restored habitat that is suitable for a threatened species—need to be measurable and verifiable to form the basis for performance. Incentives need to be sufficiently appealing so that landowners or investors will engage in a program. Transaction costs for landowners and investors—such as program enrollment and validation of credits—need to be low enough to induce participation. Stable demand for an ecosystem service or other environmental improvement is necessary through a public actor, a private actor, or both. If regulation drives demand, the regulatory environment needs to be predictable enough that the financial risks of participation are low, either for a landowner or for other private capital that would invest in conservation with landowners. With these principles in mind, there are several ways that the 2018 farm bill can help the USDA extend the reach of its conservation programs, including by reducing transaction costs, attracting additional investment, and helping capture the environmental benefits that agricultural lands provide. The lessons described in previous sections help frame opportunities to incorporate pay-for-success contracts and environmental markets into the suite of USDA conservation programs. There are several opportunities to promote the adoption of performance-based conservation programs through the 2018 farm bill, including pilot testing and research initiatives; new authorities for USDA agencies; and extensions to existing programs that support conservation innovation. There are several ways in which the farm bill can create space for pay-for-success contracts to increase the scale and performance of USDA conservation programs. Some advances can likely be made through administrative improvements—such as application processes and less restrictive partnerships, which lower barriers to private investment—while others may require new authorities. Allocating some EQIP funding to pay for the outcomes of practices would directly adopt a pay-for-success approach and, depending on the context, could support nascent environmental markets. This may be aligned with the RCPP, as partnerships with groups such as drinking water utilities present a logical buyer for the environmental services that EQIP practices provide. The utility would also have established goals in terms of water quality improvements that would form the basis for defining success in a contract with private investors. There are also administrative changes that can help support pay for success. 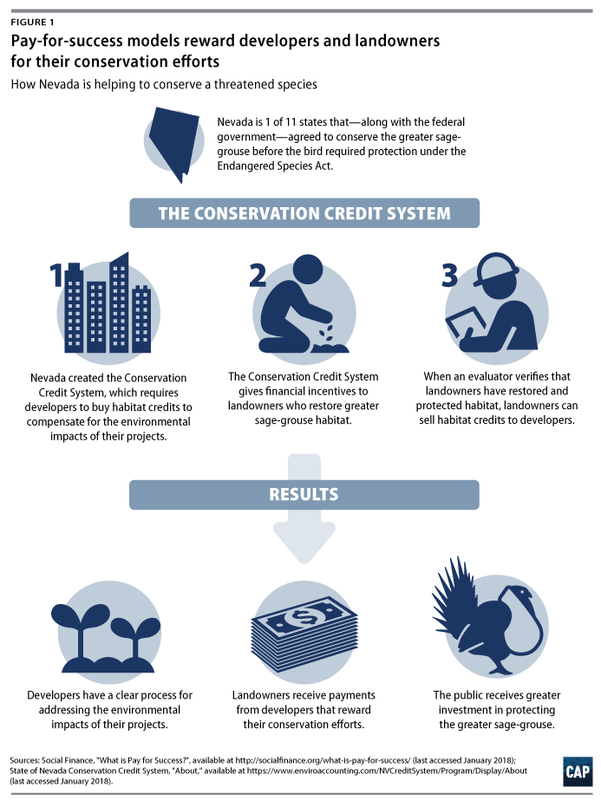 The RCPP was created, in part, to encourage partnerships between the USDA, landowners, and groups such as NGOs or utilities that improve conservation outcomes. Some obstacles, however, have prevented private entities from pursuing these partnerships. Lowering barriers to entry—for example, AGI requirements that limit business participation—would make it easier for partnerships to develop between landowners, businesses, and NGOs through the RCPP. This change could facilitate pay-for-success programs, especially through arrangements between downstream water users and upstream landowners. This approach to watershed management has become more common, with a wide range of utilities and companies serving as partners in different regions.34 Given that this type of conservation investment is well past the proof-of-concept phase, reducing transaction costs by streamlining the partnership process should have a significant effect on more widespread adoption. Since 2002, the USDA has awarded grants to projects that aim to test innovative approaches to private land conservation. The CIG program has supported pay-for-success projects in the past, including mitigation banks for threatened species and the forest resilience bond.35 Its support is especially important at the early stages of projects, when concepts have yet to be tested. Currently, the CIG program provides only short-term grants. These are well-suited for planning and proof-of-concept projects but are unlikely to be sufficient for efforts to establish demand or attract funding to scale a project. Similar to incubators used by venture capital firms, additional support is necessary to help innovative projects mature and become established. This type of longer-term support could be allocated in the form of grants through CIG or RCPP funding, and would help project partners focus on issues such as transaction costs that are hurdles to functioning independently. The various arms of the USDA collect tremendous amounts of data on land use and water that are critical to the agricultural sector, guiding management decisions on crop usage and other issues. Expanding this investment in data management to include timely and regionally appropriate information on ecosystem services will help advance the use of pay for success in conservation. Performance-based programs rely to varying degrees on the availability of acceptable measurements of project outcomes, both in terms of the measurable improvement in some natural resources as well as the size and distribution of the economic value this improvement creates. Scientific understanding of the effects of different management actions has improved dramatically as monitoring data and computing power have increased. These improvements, however, have not advanced at the same pace across different fields. While models for greenhouse gas emissions and soil conservation have become better developed,36 there is still a great deal of uncertainty about modeling the value of habitat for wildlife or the fine-scale improvements in water quality through conservation practices. In addition to increased investment in these types of tools, the farm bill can direct USDA efforts to ensure that data on ecosystem services are available in a timely manner and at a scale that is useful for directing conservation investments. In addition to soil and water data, appraisals under the Soil and Water Resources Conservation Act are required to report on conservation practices.37 In the future, these appraisals could include data on the adoption of conservation practices as well as explicit information on the broader economic benefits of conservation practices—for example, beyond individual properties. Similar information could be provided at the regional level or for specific ecosystem services through the Conservation Effects Assessment Project.38 For example, the impact of agricultural practices on greenhouse gas emissions vary by region, among other factors. The USDA should play a role in developing regional standards for measuring ecosystem services. This may be a significant undertaking that could be focused on specific ecosystem services in certain areas so that data needs for conservation investments can be met in a timely manner. Data on ecosystem services can also be applied to funding decisions for USDA conservation programs. For example, the Agricultural Conservation Easement Program could be modified to prioritize or evaluate eligibility for easements using ecosystem service values in addition to a parcel’s likelihood for development. Given easements’ financial benefits, this would make it more appealing for investors or landowners to consider the value of ecosystem services. It would also create more economically and environmentally beneficial conservation patterns with spillover benefits for wildlife conservation and outdoor recreation. The voluntary nature of USDA conservation efforts makes programs’ design and structure critically important to conservation outcomes. Landowners need to be inclined to participate, and transaction costs—along with any compensation and beneficial partnerships available through a program—are likely to affect their decision. The USDA Economic Research Service and numerous university research groups have conducted studies on landowner enrollment in different programs. But only a small portion of these have tested recruitment strategies, incentives, and program structures. Using the 2018 farm bill to invest explicitly in research to understand how different approaches engage landowners in conservation programs would be useful in determining where and how market approaches, partnerships with private investors, or more traditional cost-share and technical assistance programs would be most useful in the future. The potential social, economic, and environmental gains from conservation on private lands are substantial, but current investment levels leave thousands of landowner-driven conservation projects unsupported. This is important for conservation in the United States, since most U.S. land, especially outside of the Western states, is held in private hands. As the next farm bill takes shape, the forestry and conservation titles present a significant opportunity to shape the future of conservation for vast portions of the country. Pay for success offers a new approach to grow the pool of conservation funding by directing private capital toward solutions for environmental problems such as water pollution, carbon emissions, and declines in biodiversity. Greater investment in research on the economic value of conservation practices will help determine where pay for success and environmental markets add value to conservation, giving landowners an opportunity to be rewarded for their stewardship. Support through NRCS and the U.S. Forest Service for the continued development of markets and innovative conservation will reduce risk for both the landowners who produce environmental benefits on working lands and the companies and public utilities that invest in conservation practices. Elevating these efforts in the 2018 farm bill is a winning solution, one that would provide a high return on investment for both the public and the economy as well as help address a range of chronically underfunded environmental problems. Ryan Richards is a senior policy analyst for Public Lands at the Center for American Progress, where he focuses on natural resource economics and markets. His past work has covered a variety of topics, including water policy, ecosystem restoration, and private lands conservation. Mary Ellen Kustin is director of policy for Public Lands at the Center. Prior to joining American Progress, she was a senior policy analyst on food, agriculture, and conservation issues at the Environmental Working Group. Caroline Kitchens is federal affairs manager and a policy analyst at the R Street Institute, where she focuses on agricultural and conservation policy. She leads R Street’s advocacy efforts and outreach to federal agencies and lawmakers regarding the farm bill. William Murray is federal energy policy manager at the R Street Institute. His work covers market approaches to energy and environmental issues, including climate change and fuel choice diversity. The authors would like to thank Chris Adamo, Tim Male, Michael Madowitz, Erin Whalen, and Chester Hawkins for their assistance in the preparation of this report.